A full-rigged ship or fully rigged ship is a sailing vessel's sail plan with three or more masts, all of them square-rigged. A full-rigged ship is said to have a ship rig or be ship-rigged. Sometimes such a vessel will merely be called a ship in 18th- to early-19th-century and earlier usage, to distinguish it from other large three-masted blue-water working vessels such as barques, barquentines, fluyts etc. 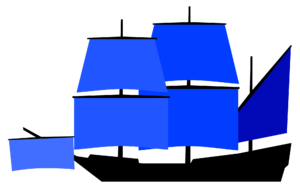 This full or ship-rig sail plan thus is a term of art[clarification needed] that differentiates such vessels as well from other working or cargo vessels with widely diverse alternative sail-plans such as galleons, cogs, sloops, caravels, schooners, brigs and carracks; some of which also have three masted variants (brigs, schooners, sloops, and galleons). The ship-rig sail plan also differs drastically from the large panoply of one and two masted vessels found as working and recreational sailboats. Alternatively, a full-rigged ship may be referred to by its function instead, as in collier or frigate, rather than being called a ship. In many languages the word frigate or frigate rig refers to a full-rigged ship. There is no standard name for a fifth mast on a ship-rigged vessel (though this may be called the spanker mast on a barque, schooner or barquentine). Only one five-masted full-rigged ship (the Flying P-Liner Preussen) had ever been built until recent years, when a few modern five-masted cruise sailing ships have been launched. Even a fourth mast is relatively rare for full-rigged ships. Ships with five and more masts are not normally fully rigged and their masts may be numbered rather than named in extreme cases. The lowest piece is called the mast or the lower. On steel-masted vessels, the corresponding sections of the mast are named after the traditional wooden sections. The lowest and normally largest sail on a mast is the course sail of that mast, and is referred to simply by the mast name: Foresail, mainsail, mizzen sail, jigger sail or more commonly forecourse etc. 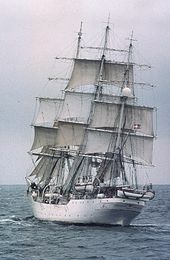 Note that even a full-rigged ship did not usually have a lateral (square) course on the mizzen mast below the mizzen topmast. Instead, the lowest sail on the mizzen was usually a fore/aft sail—originally a lateen sail, but later a gaff sail called a spanker or driver. The key distinction between a "ship" and "barque" (in modern usage) is that a "ship" carries a square-rigged mizzen topsail (and therefore that its mizzen mast has a topsail yard and a cross-jack yard) whereas the mizzen mast of a barque has only fore-and-aft rigged sails. The cross-jack yard was the lowest yard on a ship's mizzen mast. Unlike the corresponding yards on the fore and main mast it did not usually have fittings to hang a sail from: its purpose was to control the lower edge of the topsail. In the rare case that the cross-jack yard did carry a square sail, this sail would be called the cross-jack rather than the mizzen course. Lower topgallant sail, if fitted. Upper topgallant sail, if fitted. The division of a sail into upper and lower sails was a matter of practicality, since undivided sails were larger and, consequently, more difficult to handle. Larger sails necessitated hiring, and paying, a larger crew. Additionally, the great size of some late-19th and 20th century vessels meant that their correspondingly large sails would have been impossible to handle had they not been divided. Jibs are carried forward of the foremast, are tacked down on the bowsprit or jib-boom and have varying naming conventions. Staysails may be carried between any other mast and the one in front of it or from the foremast to the bowsprit. They are named after the mast from which they are hoisted, so for example a staysail hoisted to the top of the mizzen topgallant on a stay running to the top of the main topmast would be called the mizzen topgallant staysail. In light winds studding sails (pronounced "stunsls") may be carried on either side of any or all of the square rigged sails except royals and skysails. They are named after the adjacent sail and the side of the vessel on which they are set, for example main topgallant starboard stu'nsail. One or more spritsails may also be set on booms set athwart and below the bowsprit. One or two spankers are carried aft of the aftmost mast, if two they are called the upper spanker and lower spanker. A fore-and-aft topsail may be carried above the upper or only spanker, and is called the gaff sail. To stop a full-rigged ship except when running directly down wind, the sails of the foremast are oriented in the direction perpendicular to those of the mainmast. Thus, the masts cancel out of their push on the ship. This allows the crew to stop and quickly restart the ship without retracting and lowering the sails, and to dynamically compensate for the push of the wind on the masts themselves and the yards. Running downwind the sails still need to be lowered to bring the ship to a halt. ^ Quiller-Couch, Arthur Thomas (1895). The Story of the Sea. 1. Cassell and Company. p. 760. Willaumez, Jean-Baptiste-Philibert (1825). Dictionnaire de marine (in French). Bachelier.